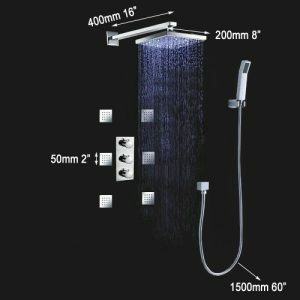 Take your shower experience up a notch by adding luxury and style with this LED body spray shower set. The visual appeal of LED shower faucets seek to not only entertain but also relax your mind and body. The LED light is powered by water flow, and will be activated once the water is turned on. This product comes with a standard shower valve without scald prevention feature. Soldby Superior Homes . Status in stock.